Advance-Decline Percent is a breadth indicator that measures the percentage of Net Advances. After the market close, StockCharts.com calculates this indicator for the nine sector SPDRs and several index ETFs. Chartists can use this versatile breadth indicator to create a breadth oscillator or AD Line. These indicators can then complement the analysis of the underlying security. For example, the AD Line based on AD Percent for the Technology SPDR (XLK) would complement the analysis of XLK. This article will explain how to use AD Percent and show SharpChart examples. A sample list of symbols can be found at the end of this article. 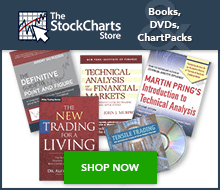 StockCharts.com has AD Percent data going back several years. Note, however, that these calculations are based on the list of stocks in the underlying security or index (i.e. XLK), which do change. This means the breadth data from two years ago is based on the then-current holdings, which may be different from the present-day holdings. Even though the holdings for the nine sector SPDRs and major stock indexes are relatively stable, chartists should keep this in mind if using a long-term chart. In the first numerical example, the Technology SPDR has 77 stocks with 70 advances and 7 declines. AD Percent is positive (+81.81%) because there are more advances than declines. In the second example, there are 12 advances and 65 declines. AD Percent is negative (-68.83%) because there are more declines than advances. As the chart above shows, AD Percent fluctuates between -100% and +100% with zero as the middle line. A +100% reading means all stocks in the group advanced, while a -100% reading means all stocks declined. Extreme readings are the exception rather than the norm. As a breadth indicator, AD Percent measures the degree of participation. An advance with AD Percent exceeding +70% reflects extensive strength because the vast majority of stocks within the group participated in the advance. Conversely, a decline with AD Percent dipping below -70% reflects extensive weakness. The raw data fluctuates with the up and down days, and creating a rather choppy-looking chart. Nevertheless, chartists can compare the positive and negative days to assess the ongoing degree of participation. Chartists can also create an AD Line to assess the overall trend and look for divergences, as well as apply a moving average to create a breadth oscillator. The chart below shows the AD Line for the Industrials SPDR (XLI) in the main window and XLI in the smaller window at the bottom. This is a cumulative measure of AD Percent for XLI ($XLIADP). The values on the right-hand scale are not important because these values depend on the starting date. Instead, chartists should simply focus on line movements and apply basic technical analysis. There are two “technical developments” visible on this chart. First, notice that a bullish divergence formed in October-November. XLI formed a lower low in November, but the AD Line held above its October low and formed a higher low. This higher low reflected less downside participation. The subsequent breakout in the AD Line (late November) turned this indicator bullish and foreshadowed a sizable advance in XLI. The second development occurred in April with another bullish divergence. The AD Line formed a higher low in late April as XLI formed a lower low. A breakout followed the higher low to trigger a bullish signal in the AD Line. A moving average can be applied to AD Percent to create an oscillator that fluctuates above/below the zero line. Chartists can look for this moving average to cross a particular threshold and look for divergences to trigger signals. Be careful with oscillator divergences because they occur quite often and don’t always produce good trading signals. The chart above shows the 21-day simple moving average for AD Percent of XLK ($XLKADP). The actual $XLKADP plot is invisible, which is a setting that can be applied under Chart Attributes/Type. See below for details or click the link beneath the chart to see a live chart with the settings. The horizontal lines are set at -5%, 0% and +5%. Notice that crosses above/below the zero line are quite susceptible to whipsaws and bad signals. Traders would be better off using bullish and bearish thresholds just above/below the zero line. In this example, a move above +5% is deemed bullish and a move below -5% is deemed bearish. These signals are highlighted with the red and green lines. AD Percent is a breadth indicator that measures participation within a particular group. The price of the underlying security (i.e. XLK) reflects what is happening on the outside. AD Percent for XLK ($XLKADP) reflects what is happening on the inside. Changes sometimes occur on the inside first - using breadth indicators can help chartists anticipate these changes. The AD Line is a cumulative indicator that can be used for short-term and long-term analysis. A moving average of AD Percent is more sensitive and acts like a breadth oscillator. AD Percent can be added to any SharpChart using the appropriate symbol (see list below). The example below shows SharpChart settings for the histogram, 20-day SMA and AD Line. The raw data should be shown as a “histogram” chart to best capture the ups and downs (red). AD Percent can be turned into a breadth oscillator by choosing “invisible” for chart type to hide the raw data. Next, add a moving average in the “Overlays” section. Choosing invisible in the first step will ensure that the moving average becomes the main security. Chartists can easily create an AD Line by setting the chart type to “cumulative” (black). StockCharts.com users can access an up-to-date list of symbols for all our Advance-Decline Percent indicators. From this list, click the “Mentions” icon to the right of a specific symbol for more details about the symbol, as well as recent mentions in Public ChartLists, blog articles, and more.